Sanya Richards secured at least part of the $1 million Golden League jackpot by winning the 400 meters in the Memorial Van Damme on Friday to finish a perfect six-for-six in the top European meets. Later, pole vaulter Yelena Isinbayeva and 5,000 runner Kenenisa Bekele had an opportunity to share the prize money with her if they won their events. 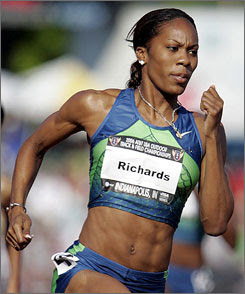 World champion Richards led from start to finish and set the season's leading time of 48.83 seconds to claim the prize. Olympic champion Christine Ohuruogu of Britain was second in 50.43. 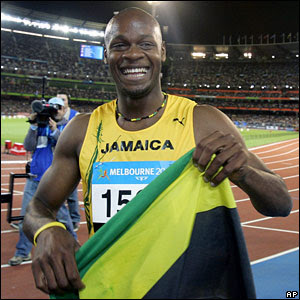 In the absence of Usain Bolt, fellow Jamaican Asafa Powell beat Tyson Gay in the 100, blasting out of the blocks and never giving the American a chance to get back in the race. On a wet track, Powell timed 9.90 seconds, edging Gay by .10. American Darvis Patton was third in 10.08. Because Bolt did not compete in all Golden League meets, he was not in line for the jackpot and competed in the 200 instead. Temperatures hovered around 17 C (65 F) and winds died down just ahead of the start of the competition. Halfway through the meet, a steady rain settled over the 50,000-capacity King Baudouin Stadium. The tough weather conditions were a setback for Isinbayeva, who set a world record of 5.06 meters last week at the Weltklasse in Zurich to make up for her loss at the world championships in Berlin. She set one of her 27 world records in Brussels five years ago, but staying perfect for the jackpot will put a big smile on her face. Two years ago, Isinbayeva won half of the jackpot, sharing it with Richards. Bekele was equally bent on sharing the jackpot. After feeling tired in the wake of his fifth win at the Weltklasse, he flew straight back to Ethiopia for four days of high-altitude training before rushing back for Friday's race.